Though this year it is superseded by a Sunday, normally today would be the feast of Our Lady of Sorrows. “And Joseph and his mother marvelled at those things which were spoken of him. And Simeon blessed them, and said unto Mary his mother, Behold, this child is set for the fall and rising of many in Israel; and for a sign which shall be spoken against – yea, a sword shall pierce through thy own soul also – that the thoughts of many hearts may be revealed” (Luke 2:33-35). The message is about Jesus as a sign of contradiction. Everything about him will challenge us, and reveal what is really in our hearts. His radical preaching will do that: will we follow this man, or not? That is the ultimate question, the final judgment on what sort of people we are. And then, above all, in his suffering: are you willing to go to the Cross, to embrace a Lord whose kingdom calls beyond the comforts of this world so radically that his reign here will end on the Cross? This is how many will rise and fall: those whom the world judges great will be afraid to follow, and those who seemed of no account prove to be the saints. Mary too participates in this dynamic. Mary above all, because no one is naturally closer to Jesus. The Cross pierces no one’s heart as it does his mother’s. We cling to Our Lady of Sorrows above all so that we can learn from her to enter more deeply into the full measure of the Cross. We discover in Mary the reality of Jesus: not just an idea, not just an apparition, not just a storybook character, but the Son of Man, born of a woman, born under the law, born among us, who truly suffers and dies, and enters into the full misery of sinful humanity. In general Mary is there to help us meditate on his true humanity. 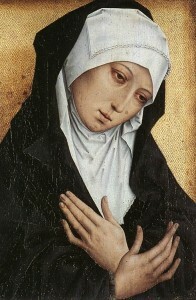 But at the Cross, the mother’s anguish becomes especially important. She takes us into the heart of the matter. “Now there stood by the cross of Jesus his mother, and his mother’s sister, Mary the wife of Cleophas, and Mary Magdalene. When Jesus therefore saw his mother, and the disciple standing by, whom he loved, he said unto his mother, Woman, behold thy son! Then he said to his disciple, Behold thy mother! And from that hour that disciple took her to his own home” (John 19:25-27). Actually, in the Greek, it’s not just his own home, it’s more generally, “into his own” – his everything. For John, the most profound and mystical of the Gospels, this is one of the keys of the Cross. First, that Mary stands: stays there, and does not faint. And second, that the beloved disciple, the sign for all of us, makes Mary, Mother of the Cross, his own. He discovers Jesus in discovering Mary at the Cross. A final Biblical key to the doctrine of Our Lady of Sorrows: St. Luke always presents her as grappling with the unknown. When the shepherds come, he says, “And all they that heard it wondered at those things which were told them by the shepherds. But Mary kept all these things, and pondered them in her heart” (Luke 2:18-19). And when they find him in the Temple, “He said unto them, How is that you sought me? Did you not know that I must be about my Father’s business? And they did not understand the saying which he spoke unto them. And he went down with them, and came to Nazareth, and was subject to them: but his mother kept all these sayings in her heart” (Luke 2:49-51). Our Lady of Sorrows is also Our Lady of Unknowing. Maybe the hardest part of suffering is that it doesn’t make sense. We can’t see to the bottom of it. But this is the way of faith, of trusting in God even when it doesn’t make sense. Mary can’t understand the good news from the shepherds, and she can’t understand the scolding from her Son, or the prophecy of Simeon – or the horror of the Cross. Faith does not mean everything makes sense. But Mary’s part is to hold God’s mysterious workings in her heart, and stand by the Cross of Jesus.